For some Americans, concerns about Russian spying and interference in its elections are growing, with new reports emerging nearly every day. 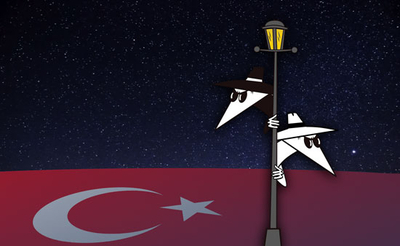 But in Europe, officials are fighting off an even greater incursion from another country, which is now spying even on civilians: Turkey. Erdogan's involvement in European affairs beyond Turkey's borders, especially in the affairs of Europeans of Turkish descent, is nothing new. In 2008, while speaking at a rally in Cologne, Germany, he encouraged all European Turks to resist assimilation, which he called "a crime against humanity." In 2013, he interfered in a Dutch child abuse case against a Dutch-Turkish mother after the child was given over to lesbian foster parents. And last year, he called on German Chancellor Angela Merkel to prosecute a German comedian who had written a song critical of him. But the latest efforts indicate an even greater bravado, says Elise Steilberg, a Dutch columnist who frequently writes on Turkish politics. "The clearer it has become that Erdogan aims at a one-man-rule, and that in working toward his goal of constitutional change he won't hesitate to use unconventional means, the more obvious it has also become that he will do anything to get as many European Turks behind him as possible," she said in a recent e-mail. "Erdogan is now openly using all available channels to increase his influence within Europe." The Dutch passport situation is a salient example of this effort. Both dual Dutch-Turkish citizens and Turkish citizens with residency permits have reported that their passports were confiscated at the Rotterdam office. In each case, they were said to have ties to Gulen, to Kurdish groups, or to journalists and others critical of the Turkish government. For dual citizens, this is bad enough, but those with only Turkish citizenship are rendered stateless by such a move. Some have argued that this action represents a flagrant violation of United Nations conventions, but Turkey is not a signatory to those conventions. There is, however, an option offered to those whose passports are revoked, reports Dutch newspaper Trouw, which first broke the story. To obtain a replacement, they will be provided a one-day passport that allows them to return to Turkey. On arrival, they will be held in custody, effectively imprisoned until they can plead their case in court – a process that can take six months. In one particularly disturbing case described in Trouw, a Turkish woman was forced to relinquish her passport because her husband is a Gulenist. She is not. But Ankara has not stopped at the door of its consulates. With Dutch elections set for March 15, Turkey is allegedly paying imams in The Netherlands to urge Dutch-Turks to vote for the anti-integration Denk (Think) party, led by Tunahan Kuzu and Selçuk Ozturk, both of whom are Turkish-born. Among Denk's objectives: a culture of "acceptance" rather than integration, the creation of a "racism register," and the formation of a "racism police." In an interview with Elsevier, Dutch Turkish Council Director Sefa Yurukel described the "vote Denk" messages distributed by the imams as containing "the typical arguments of Islamists." Further, he said, they indicate that Denk likely enjoys support from the Diyanet, a government body that oversees religious affairs in Turkey and among the Turkish people worldwide. It is just that sort of effort to monitor and manipulate the behavior of Turkish citizens, even those who do not live in Turkey, that has Steilberg most concerned. While "of course all countries spy" on one another, she says, the idea of civilians spying on civilians is especially chilling. Already the Dutch have experienced some of the worst of this, as when Twitter users in the Netherlands reported to the Turkish authorities the anti-Erdogan tweets of Dutch-Turkish columnist Ebru Umar. Umar, who was in Turkey at the time, was immediately arrested, and was not permitted to return to the Netherlands for several weeks. She was eventually released only thanks to the intervention of Dutch Prime Minister Mark Rutte. Now, as such government intervention becomes increasingly intertwined with religious manipulation and intrigue, the reaches of Turkey's growing theocracy into European culture seems an imminent, and ever-expanding threat.